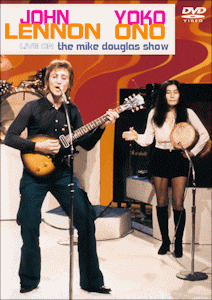 John Lennon & Yoko Ono - Live on the Mike Douglas Show DVD (Region 1) Five-Disc Set. Color. John Lennon, Yoko Ono, Mike Douglas, Chuck Berry, George Carlin. In February, 1972, The Mike Douglas Show broadcast a full week, five shows, with co-hosts John Lennon and Yoko Ono. Included among guest appearances and musical performances are John and Yoko discussing their love for each other, Lennon's boyhood recollections, Ono's unique art projects, and lots of candid discussion. Nobody describes these shows better than Mike Douglas himself: "It was probably the most memorable week I did in all my 20-something years on air." This Five-Disc DVD set includes all five programs.